Promoting student success, Cowley College recently had a booth at the Women’s Fair held February 19-21 at Century II in Wichita, KS. 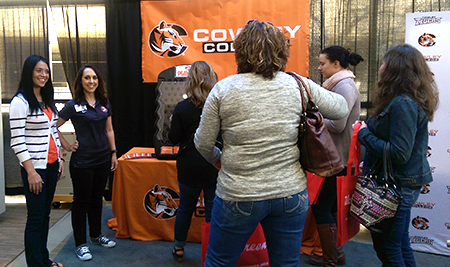 According to Cowley College admissions director Marcus Hicks, numerous high school seniors stopped by the college’s booth with their parents to inquire about the institution. Also, more than 100 people entered the drawing to win Brad Paisley concert tickets or a gift card to the Cowley College Bookstore. Cowley College president Dr. Dennis C. Rittle was happy to see the college have a presence at the event. Hicks said the college is looking forward to participating in future Women’s Fair events to further grow the Cowley College brand in Wichita.